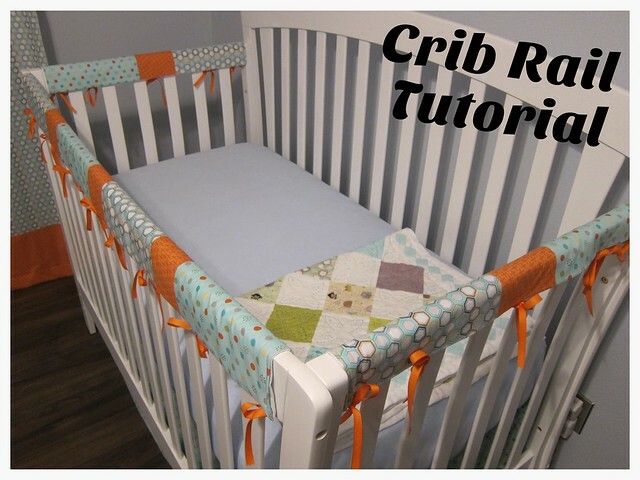 Start by measuring your crib rails. My short ones measured at 21.5x7 inches and my long one which is a little fatter measured at 53.5x9 inches. You want to measure around the whole rail to get the width, not just one side. 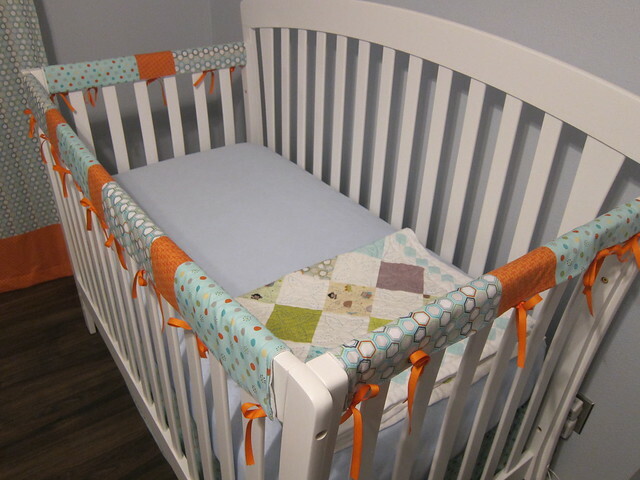 I knew I wanted to use all three pieces of fabric on each of mine, but didn't want a lot of the orange. 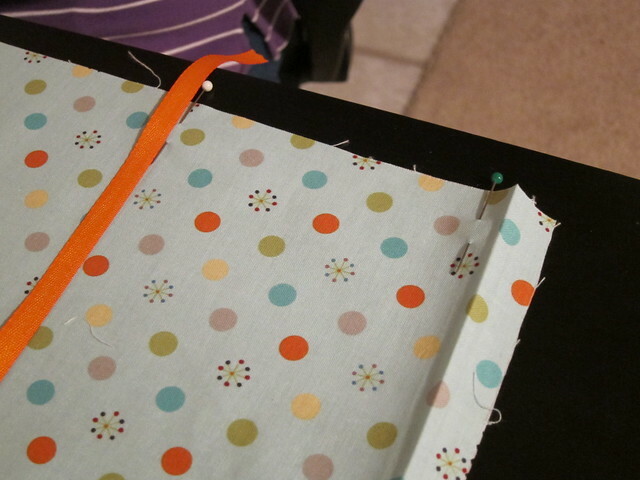 So however you want to divide up your fabric do so and then add in your seam allowances. I think we did 1/4 inch seams on all sides. 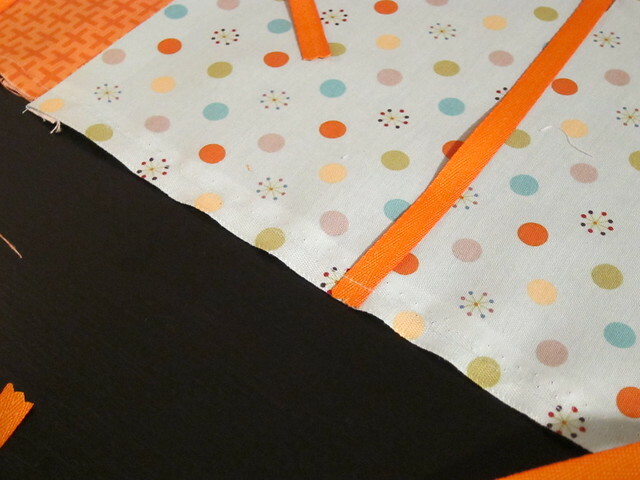 For my shorter rails I cut 2 of the hexagon and two of the polka dot to 12 x 7.75 and 2 of the orange pieces to 6.25 x 7.75. 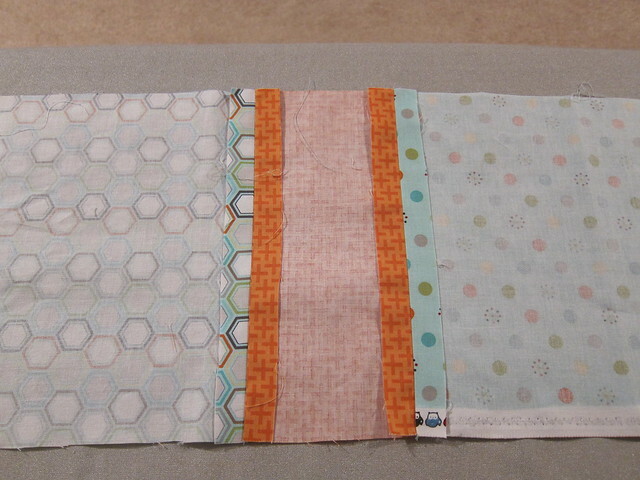 For my longer rail I cut 2 of the polka dot and 2 of the hexagon at 11.75 x 9.5 and 3 pieces of the orange at 5.25 x 9.5. Just cut your quilted fabric to the entire length. Start by pinning your colored fabrics together and sewing your seams. Once that is complete you'll want to pin where you want your ties to go. 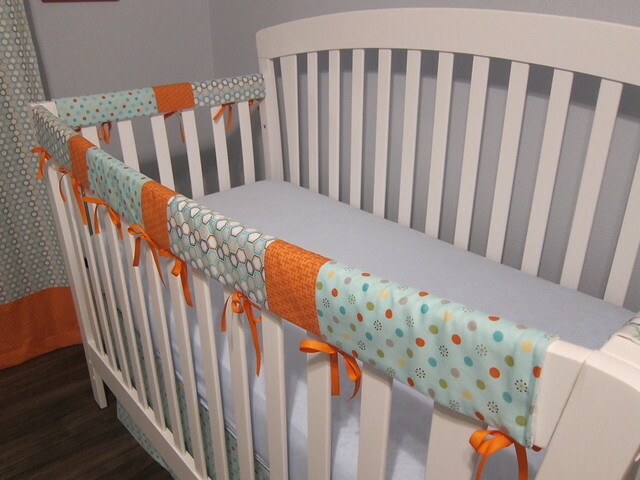 We took ours to the crib and then pinned the ribbons to where we wanted them placed. Sew your ties in place. 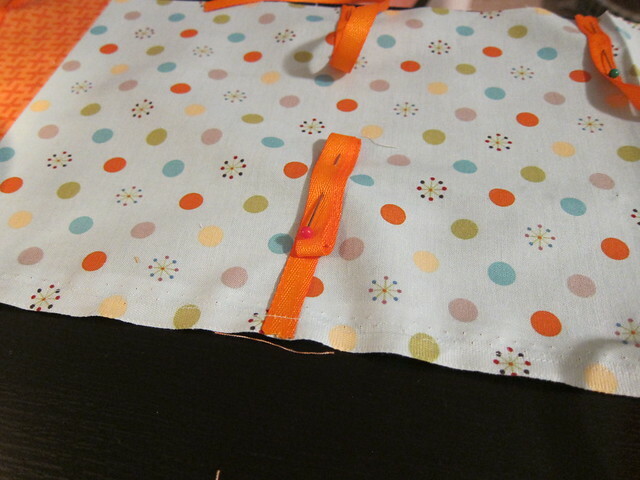 In order to keep your ties from getting in the way when you turn your fabric right side out pin them up. It'll make turning easier and helps to make sure that you don't sew them when you sew your quilted fabric on. 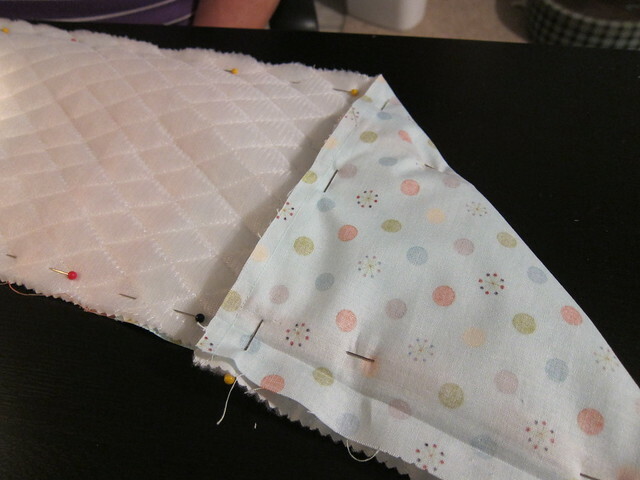 Pin your two pieces right side together and then sew your quilted piece to your fabric. 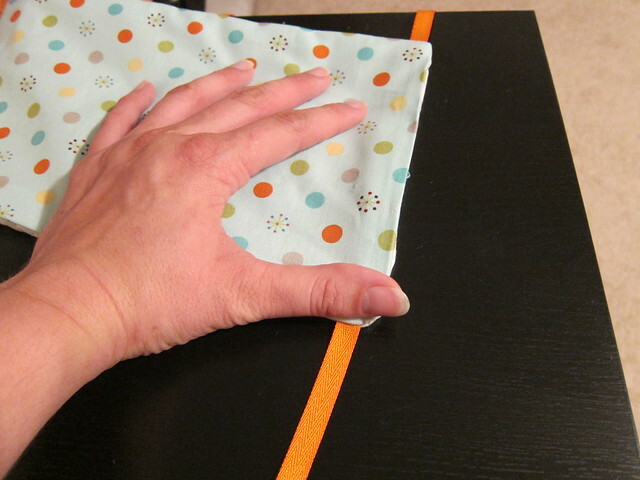 Leave the two ends unpinned so that you can turn your fabric right side out. Once your fabric is flipped right side out pin your ends and sew your seams. Repeat this two more times on your other pieces and you're done! Very cute! Your color scheme is awesome, btw! Thanks Dawn! I'm so anti traditional baby characters and themes. I just went with colors and patterns that I liked. I'm still waiting to get a few things, but I love how it's coming together. I really love the colors and patterns you've chosen.